Here is a cool, refreshing, recipe idea for summer get togethers. Follow package directions to cook pepe pasta. While water is boiling, drain the juice from all 3 cans of pineapple into a separate pan. Put pineapple into a large mixing bowl and set aside. Combine flour and sugar and add to pineapple juice, along with lemon juice, and salt. - Cook until it thickens to a syrup consistency. When pasta is done cooking, strain and rinse in cold water until cool. Add pasta and thickened syrup to the pineapple. Let sit overnight (or at least 3 hours). 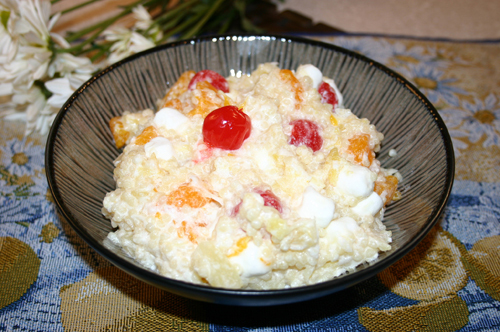 Fold in oranges, cherries, coconut, cool whip and marshmallows. Salad is ready to serve. recipe software with over 1 million copies sold!